If anyone doubted that St. Louis was left in good hands after the promotion of Archbishop Burke to Rome, have not fear. 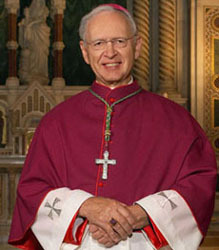 In an interview published Friday, Bishop Robert Hermann, administrator of the Archdiocese of St. Louis, said that it would be a ‘privilege to die tomorrow to bring about an end to abortion.’ For another article read the the report on LifeNews.com. (Steve’s Note: In my earlier years I used to be a member of a cultish group with similarities to the one mentioned below, so this is interesting. Groups that are secluded and “exclusively right” and break away from the stability of authentic tradition and leadership often spin off into cultish authoritarianism. I lived through it for 6 years). An eccentric Mexican sect illustrates the fate of many groups that break away from the Catholic Church: personal and doctrinal disputes are threatening the future of a group that would not accept the authority of the Holy See, yet imposed far more rigorous authority on its own adherents. Next post: Shop at Walmart this Year!